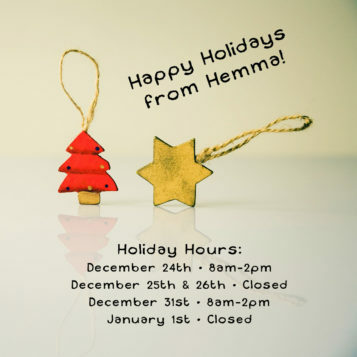 From all of us at Hemma, we wish you a happy Holiday season! Regardless of what you celebrate or how you celebrate, we hope you find time for rest, connection, and nourishment as we nudge closer to 2018. Holiday Sales from December 18th-24th! These punchcards don’t expire, can be shared, and make great gifts! If you are new to Acupuncture, 5 treatments is a great way to experience how Acupuncture can support your overall health. You can purchase online here! Free Yoga with Class Pass Purchase! Purchase a 10 class pass and receive 1 free class. Purchase a 20 class pass and receive 2 free classes. We need your blankets, sleeping bags, and warm winter gear! 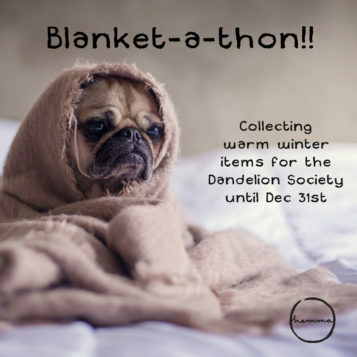 Once again, we are focusing our giving efforts close to home this year by supporting the Dandelion Society ( www.hopeliveshere.ca ) by collecting warm winter items. The Dandelion Society was founded by Rev. Al Tysick. Reverend Al has been working with the homeless for 40 years and was one of the primary founders of “Our Place”. He started the Dandelion Society in 2011 in an effort to provide care and support for people in our community who are unable to access even basic care and support from places like Our Place. Donate any and all of the following items at Hemma before December 31st. Please ensure they are either new, or clean and in excellent condition. Several of these items are needed NOW and will be donated immediately directly to those in need. Please note – the emphasis is on blankets, sleeping bags, and warm coats.